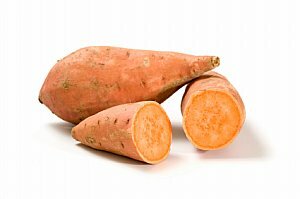 Sweet Potato facts, an information sheet for kids cooking activities. Sweet potato facts and general information about sweet potatoes. Available year round but harvested in the fall. Sweet potatoes grow on trailing vines that cover the ground. Select sweet potatoes that are firm with bright skin. They should have no spots or mold. Bake in oven as you would white potatoes, steam, grill or microwave. Sweet potatoes are high in fiber, protein, Vitamin A, Vitamin C, iron and calcium. Prepare 2 sweet potatoes by piercing skin with a fork in several places. Bake for 45 minutes at 400 degrees. Let cool slightly so you can handle the potatoes. Cut in half lengthwise. Take sweet potatoes out leaving the shell intact. Place potatoes in bowl and mash with a fork. Add butter, dash of cinnamon and heavy cream. Mix together and taste. If taste is as desired re-stuff potatoes. Warm up again in the oven. Serve with steak or other meat. A twist on a sweet potato dish that the kids can help adults put together. You can prepare this a day ahead and bake 25 minutes before serving dinner. Adult can bake sweet potatoes by placing in a baking dish. Poke with forks several times. Bake at 400 degrees for 45 minutes or until fork can be inserted in middle easily. Let cool. Cut sweet potatoes in half and kids can scoop out pulp into bowl. Kids can do the remaining of the recipe with a little adult's help. Add butter and 2 tablespoons of brown sugar to sweet potatoes. Beat together. Add in eggs, orange juice, 1 1/2 teaspoon cinnamon, salt and nutmeg. Mix until well blended and smooth. Pour into baking dish. Flatten sweet potatoes smooth. In separate bowl, mix together topping ingredients, flour, oats and nuts. Then add in 1/4 Cup sugar and 1/2 teaspoon cinnamon. Mix together then blend in 1/4 cup butter with fork or clean hands. Mixture should be crumbly. Sprinkle over top of sweet potatoes. Adult can bake in 350 degree oven for 25 minutes. Bake sweet potatoes until tender. Cool and cut into chunks. Spray a baking dish with cooking spray. Place sweet potato pieces in bottom of baking dish. Layer apple rings over top of potatoes. Keep layering apples and potatoes. In a pan, add orange juice, brown sugar, cornstarch and cloves. Heat until mixture thickens. Pour over sweet potatoes and apples. Top with pecan pieces. Bake at 350 degrees for 15 minutes or until apples are tender. Kids can help peel potatoes. Then have an adult slice potatoes thin. Meanwhile kids can prepare a large bowl of ice water. Place potato slices in water for 1 hour. After 1 hour, drain on paper towels and pat dry. Adult should fry in oil that is 375 degrees for several minutes, until golden brown. Kids can pat dry and sprinkle with salt at this point. Back to Food Facts from Sweet Potato Facts.